First day in France. We arrive early (having lost an hour on the boat) but will quickly make time across flat ground after leaving St Malo. We will take coffee in Cherrueix, followed by lunch in Ducey (a new restaurant this year). After lunch the climbing starts, along a mix of roads and old railway lines. 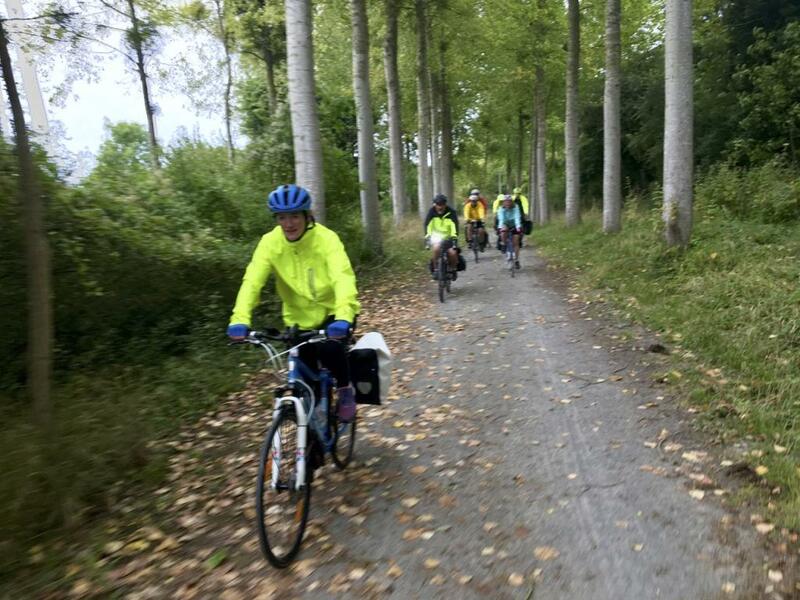 We should arrive in Vire around 1700, with plenty of time for a rest, a spruce up, and a beer before dinner. Only 9 riders for this trip, after Nicole sadly had to pull out at the last minute due to illness. We emerged from the ferry nice and quickly to be met with a rain shower. This had been predicted, but was nonetheless a little disappointing. John Tranter kindly decided to fit waterproof covers to his panniers, which caused the rain to stop and hold off for a decent period. 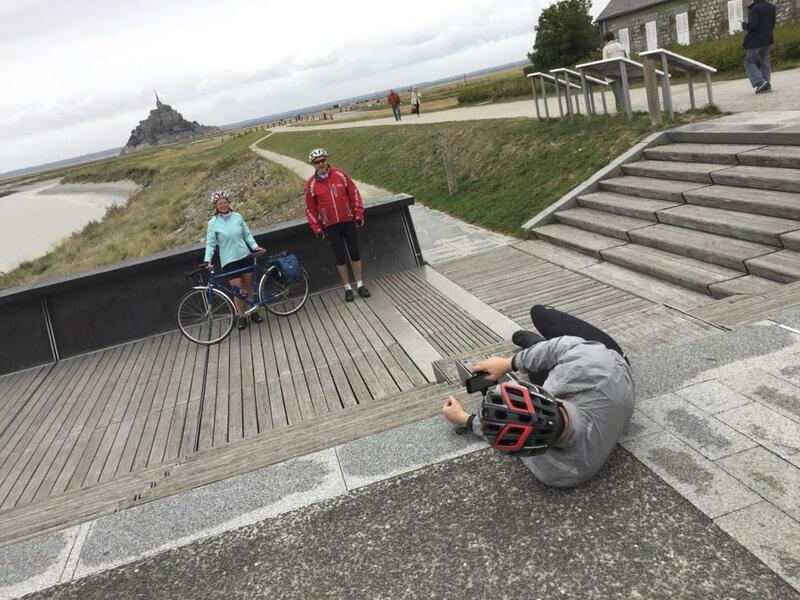 The route out of St Malo proved to be a little challenging due to a couple of '"DÃ�ï¿œÃ�Â©viations" caused by roadworks and a closed lock bridge. 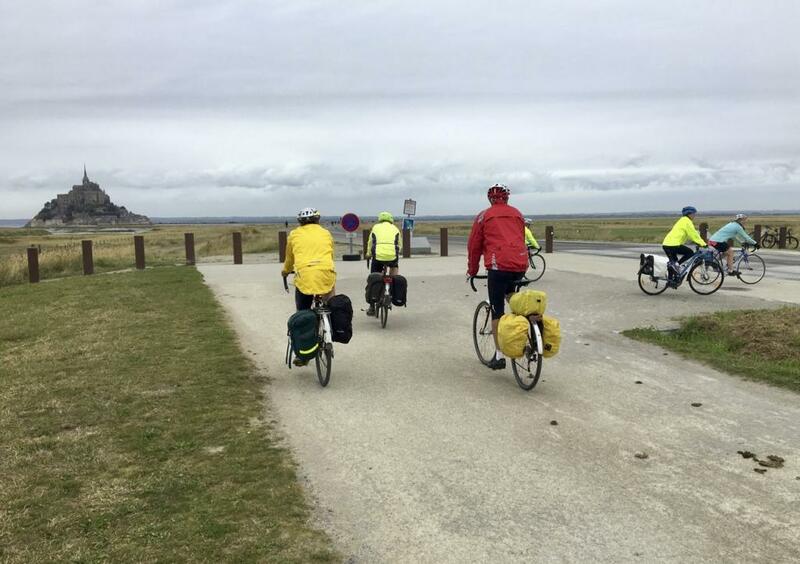 But we were soon on our way along the Baie de la Seine coast road, aided by a brisk westerly wind. With perfect timing (Luck or judgement? Your call...) we arrived at our regular cafÃ�ï¿œÃ�Â© stop in Cherrueix just as Monsieur le Patron was opening up. 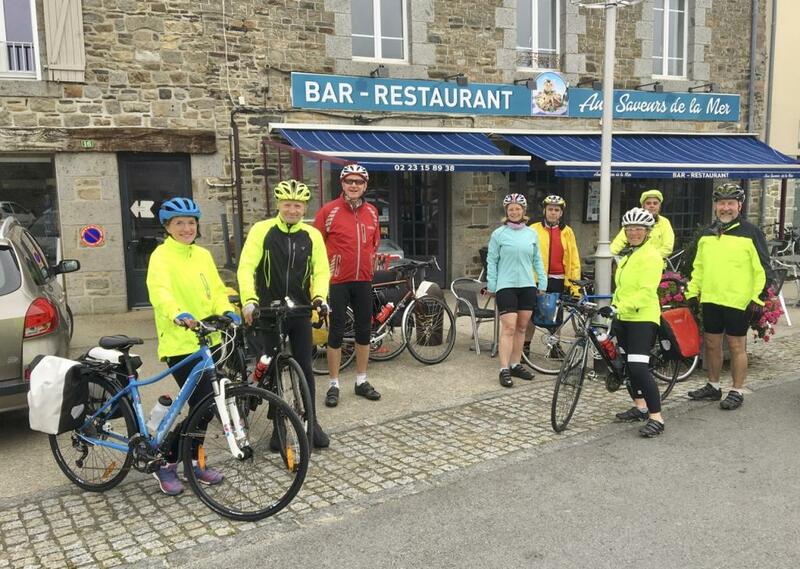 A very efficient delivery of coffee, and an equally efficient provision of patisserie from the shop next door fortified us in preparation for the next stage past Mont St Michel. 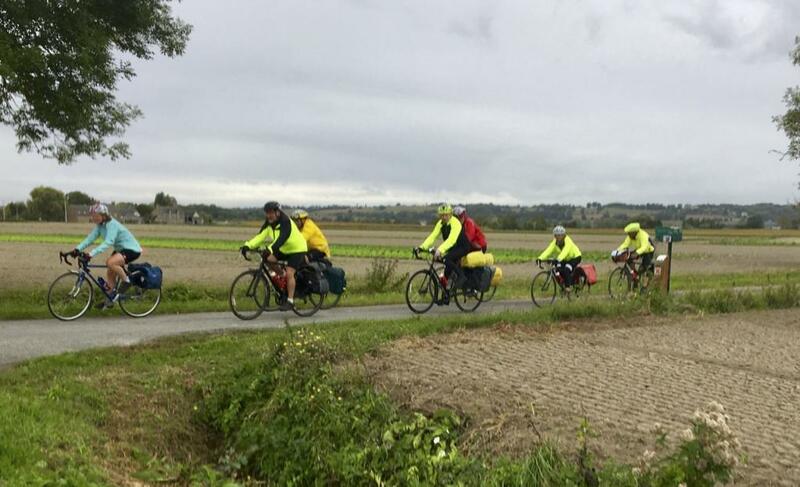 Following the "Voies Verte" through fields we crossed the river Cousenon to head north towards the Mont. En route Richard suffered the first (and thankfully only) puncture of the weekend. Leaving the Mont in our rear view mirror (well, Karen's anyway) we headed towards a potential lunch stop. Booking had proven impossible, with every restaurant apparently closed. In the end we dipped in (naval slang for "got lucky" )with a most accommodating boulangerie in Pontorson and with the rain holding off (we'd had showers all morning) we ate on picnic benches by the river. After a last tricky drag up into the town centre, accompanied by the slightly bizarre piped music that plays on Vire's streets, the somewhat bedraggled group arrived at the hotel, tired, wet, but thoroughly chuffed with ourselves. 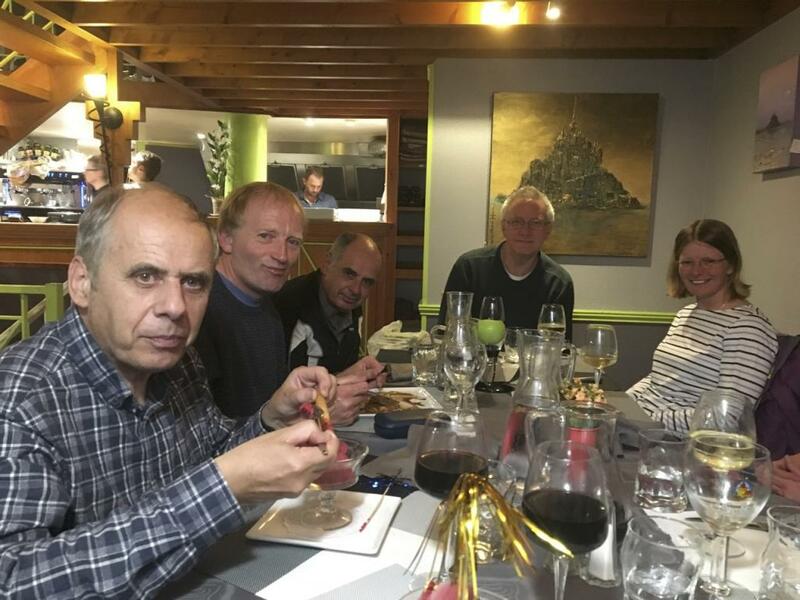 Not long after, and fortified by hot showers and Grimbergen, we enjoyed another excellent post-ride meal at our favourite Vire restaurant, Le Robbery. Outside the café in Cherrueix. Typical quiet Normandy back lanes. 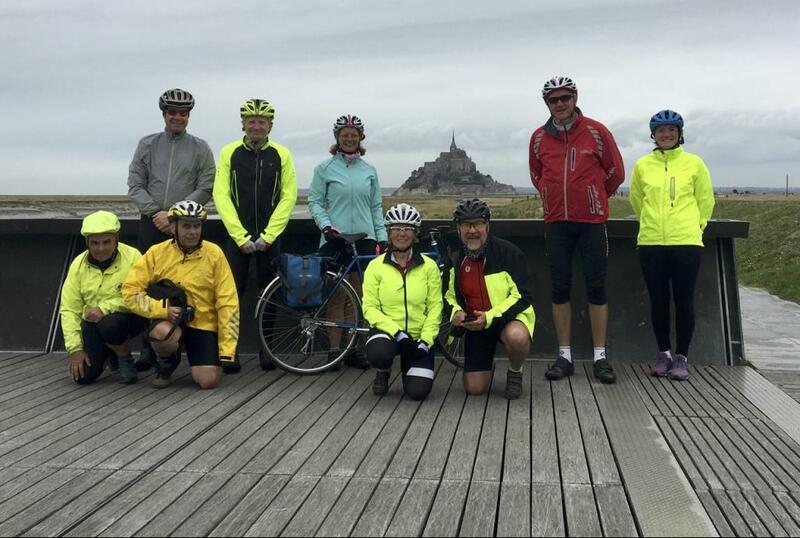 The group with Mont St Michel in the background. Bit more hilly than usual. Quite flat through the Vale and then uphill at Ashbury and lovely downhill stretch to Lambourn. Down the Lambourn valley to Great Shefford and then uphill northwards towards Wantage with a coffee stop at Sadddleback CafÃ© after approx. 30 miles. Down Chain Hill and back to Grove. Des had kindly picked up the ride lead in place of Suzy, but it was clear fairly quickly that he was out of sorts and at Baulking he decided to head back with Lorna (who had only been planning to ride this far in any case). 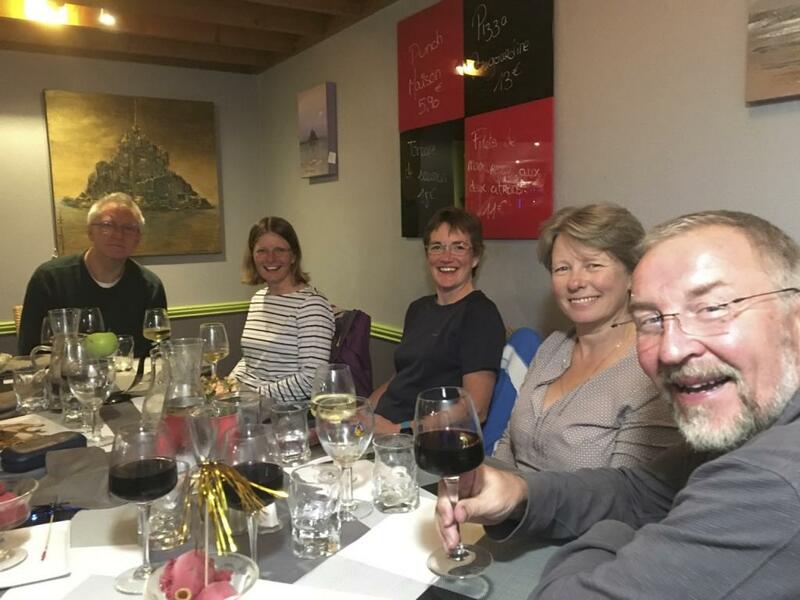 So I took over the ride leading and we continued following Suzy's route through Uffington and on to Knighton where the short climb up to the B-road exercised our lungs. On to Ashbury and the first main climb of the ride up the eponymous hill. We regrouped by the Ridgeway at the top. 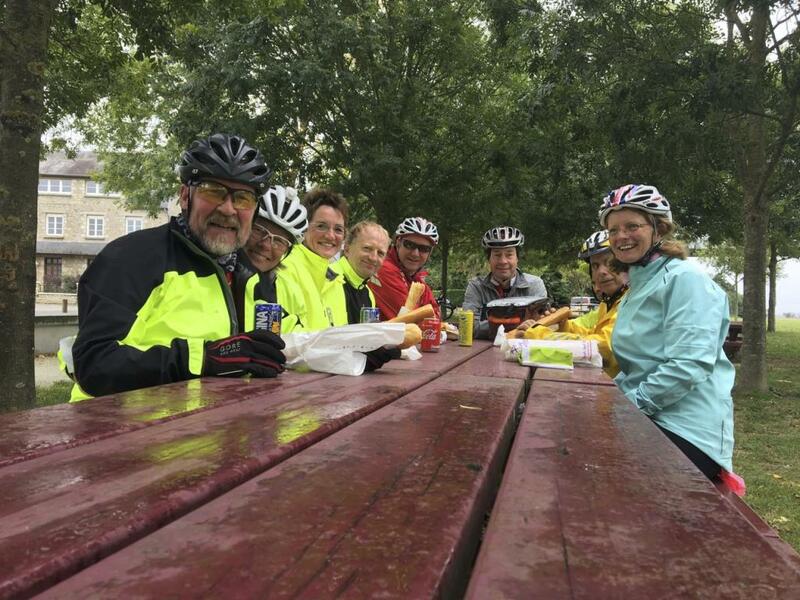 By now the rain had set in steadily and the suggestion to stop in the cafÃ�Â© in Lambourn rather than continue to Saddleback, rejoined by "and back over Hackpen?" was unanimously agreed. So after a damp descent into Lambourn, we welcomed the warmth of the cafÃ�Â© and hot drinks. The ride back was just plain wet! The rain stung our faces on the fast descent of Hackpen hill and after the Letcombes we split to go our various ways. One of those days when it felt good to have been out but even better to get home again! We missed your company on the rest of the ride, Des. Best wishes.